Color film has been around since 1936 and yet black and white photography has remained popular as an art form. Many art photographers shoot exclusively in black and white. Others choose black and white film when the subject calls for it. Ansel Adams was known for his black and white studies of California’s awe-inspiring Yosemite Valley. Annie Leibovitz uses black and white portraits to reveal the gritty side of humanity. These photographers viewed color as a distraction. Black and white photography take it down to the fundamentals of art—Contrast, shadow, light, shape and line. If you’re a serious hobby photographer, you have probably tried to display your work, but had difficulty selecting pieces that work together. A hodgepodge of photographs is difficult to display. 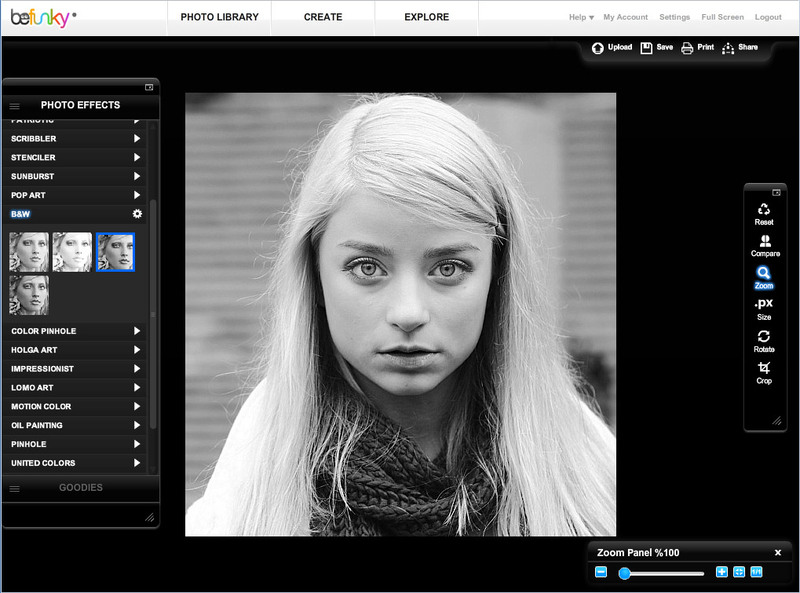 But if you use the BeFunky B&W effect on your photos, suddenly you have a unified collection in black and white. Alternatively, to create a collection of “vintage” photos, try the Old Photo effects. Select or take a color photograph. These effects will also work on black and white photos, but you’ll see more dramatic changes if you start with a color photo. Choose or take a photograph that includes a variety of colors with some dark and light areas. If you are snapping a new photo, try to imagine what it will look like in black and white. Think contrast. 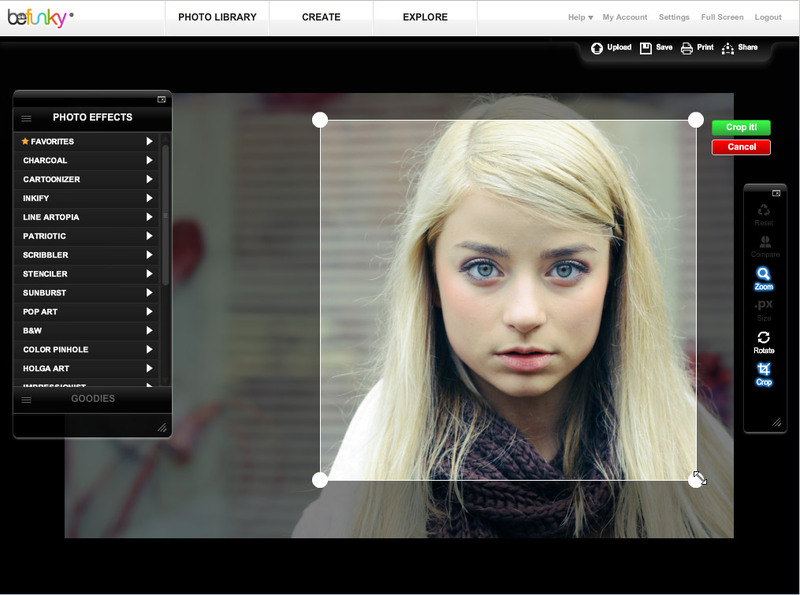 Once you have the right photo, go to the create page to get started. Hold your mouse over the Upload button to select your image and bring it into the work space. Click Upload to select your image and bring it into the work space. You have several upload options. Select an image on your computer, snap one with your web cam, type the URL, or grab one from a photo sharing site. You can also use an image you have previously uploaded. When your image appears on-screen you may want to use the cropping tool to zoom in tighter. Imagine the cropping tool is the frame it will be inside later, hanging on your wall. Drag the corners of the tool to frame your photo just right. Next, click B&W in the left margin. The menu expands, displaying several effect options. 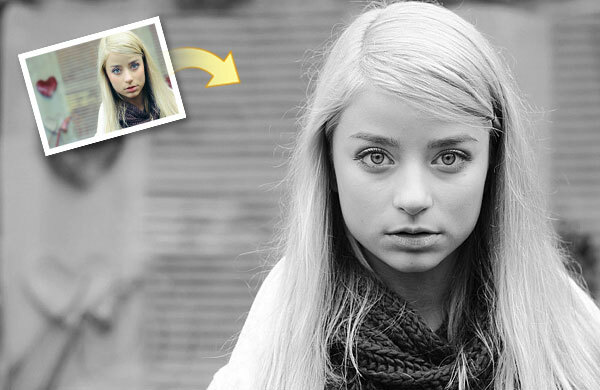 Select an effect to start the modifications to your photo. The BeFunky progress bar appears while your image is modified with the chosen effect. It won’t take long. Soon your modified image will appear on screen. Now wasn’t that easier than an hour in a darkroom? But don’t stop there. Try each of the effects. You will begin to notice how colors are displayed in differing shades of gray depending on the chosen effect. You can exaggerate these differences by changing the contrast. Click Settings button (gear icon ) next to the effect name to open the Settings pop-up. 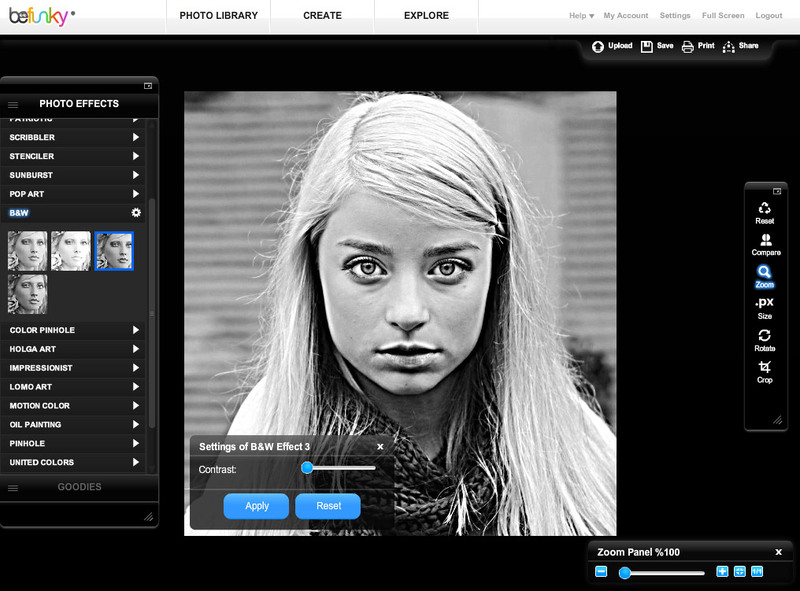 Each B&W effect has a contrast setting that you can change with the slider control. Slide the control to reduce or intensify contrast and click Apply to see the result. Show off your newly framed black and white photographs to your friends. When they ask, tell them you did it yourself on BeFunky.com They will thank you later after they’ve created their own artistic black and white photos. Let us know how you used our B&W effects.